Tulsa Roofing Company- What sometimes rolls, sometimes is struck, and sometimes plays in a town of bricks? The Thunder! Roofscapes Exteriors is having a #roofscapesgiveaway this month leading into March! Since it’s prime time for basketball season, we thought it’d be a great idea to do a giveaway! The game start is at 7:00 PM on Saturday, March 26. How can you enter to win this awesome weekend getaway? As for the team and players, Russell Westbrook took home the NBA ALL-STAR game MVP honors as of last night. And since there are rumors that star player, Kevin Durant, might be up for grabs should be enough of a push to enter to possibly win and see him play as a Thunder! 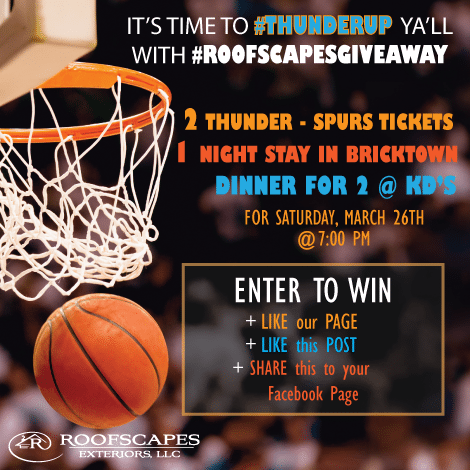 Roofscapes Exteriors, LLC is the local roofing company of Bixby, OK. Our team likes to help out the community in various ways, and giving back with a promotion is just one of them! We specialize in re-roofing projects and roof replacement. Working with a local roofing company might seem like a daunting task to take on, but we like to think of ourselves as “consultants” because we walk our customers through the process that educates about the roofing system. Before making any moves with a reinstall of a roof, we like to have our clients confide in us. Connect with Roofscapes Exteriors- the Tulsa Roofing Company on Facebook, Twitter, and Instagram to catch up on updates and various promotions ran throughout the year! Commercial Roofing Tulsa- Repair or Replace? Commercial Roofing Tulsa- How bad is the roof and how much is damaged will determine if you should repair or replace the commercial roofing system. Problems can arise from a roof install that went wrong, designed incorrectly, not properly maintained and just typical wear and tear. Even though commercial roofing in Tulsa is designed for long-term performance, there can be many problems that develop during the lifespan of the roofing system. When you’re looking into fixing a commercial roofing system, there are a couple options of full replacement, repair, re-cover and coat. How do you determine which maintenance you’ll need? How easy would a tear off be? Going down the path of these questions will determine the best route to go. With a repair, some of the roof problems can be minor and easily repaired. If the membrane of the roof is in good shape or if the roof has good insulation, a repair might be in-store. Some of the benefits of a roof repair in Tulsa is less costly than a roof replacement, and will help extend the life of the roof. Sometimes the roofing system doesn’t need a full overhaul. Choosing a re-cover includes a redo of the membrane if the roof hasn’t been re-covered prior. The benefits of a re-cover include cheaper maintenance, extended warranties, and less disruptive than a complete replacement. Sometimes a commercial roofing system needs an overhaul of repairs that add up to being a complete roof replacement. For example, if the commercial roofing system has been repaired before, you will need to replace it. A rule of thumb to know if it’s a replace or repair is that 25% or more of the roof is damaged, a replacement should be implemented. Most commercial roofing systems have incorporated a coating in order to extend the life. A coating can simply add extra protection against leaks, helps improve the aesthetics, cost effective, and energy savings with reflecting heat and UV qualities. If you live within the Tulsa or Oklahoma City area, our professional roofers can help determine whether or not you’re in need of a repair or replacement for your commercial building. Connect with Roofscapes Exteriors on Facebook, Twitter, and Instagram to learn more about our commercial roofing Tulsa and other services for your home!